Let’s face it, we might only have two or three reasonable ideas for each kid and we kinda have to keep those things for Santa to bring. Thankfully, I had an epiphany about two years ago when I clicked that we could get some vouchers for days out to W5. When I looked into it further, a season pass was a no brainer. When we did the maths, you’d only have to visit 4 times over the year to get the value out of it. As the year comes to an end, we’re now looking at renewing it and the deals have gotten better. 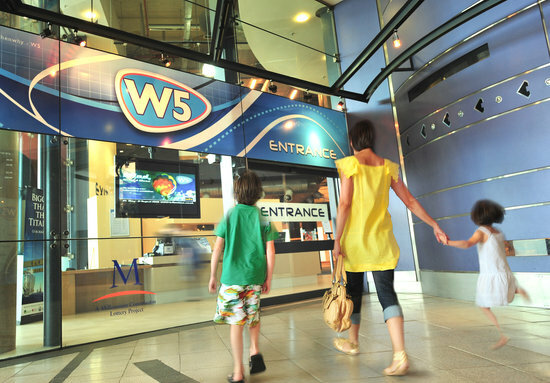 W5 are really pushing their season passes right now and as such they’ve upped the benefits and lowered the price – Now, with a season pass you get 10% off at their cafe inside but we can also keep the costs down by bringing a picnic and at any of the tables you can set up and have a feed without opening your wallet. Discovery: (8 and under) – has fab role play, art and music sections that are so good that the kids won’t even know they’re learning. Go: (All ages) Hands on science with features exploring health, hygiene, genetics, geology, electric circuits, flight and forces. See: (8+ years) An interactive area featuring nature and biodiversity, sustainable development and now includes Think Creative a themed area where you can be an animator and create cartoons. Do: (8+ years) Design and build structures, bring robots to life, make patterns and play virtual sports with a demonstration area where energetic staff get involved. ClimbIt: (3+ years) This is such a cool, huge multi-storey climbing structure, which is a cross between a maze and a jungle gym. We try to get A on this every time but he’s yet to muster the courage. Seasonal Exhibits: (currently a fab Halloween exhibit): The Christmas event has a wonderful Santa and my sister in law worked as a Disney princess over two years and she gave us real insight into all the work it takes to bring together and it really shows. Last year their exhibit had a tiny train that went around it and the kids LOVED it. In previous years, we paid for a season ticket @ £127.50 however, given their latest push on the season passes, they are doing a deal for one month free when you pay by direct debit at a rate of £9.75 per month so this is an annual cost of £117 and the discounts scale up with the number of kids/adults – see table here. We visit around 6 times per year and if we were to do this without the season pass it would cost a whopping £180. It’s such a good day out and given that it’s so big, we feel like there’s always a new area to explore a bit more and having had two years of the kids going every couple of months, I can definitely see A’s interests developing and understanding of the sciences growing. To date, my generous granny has bought the season pass for the boys as their combined gift, but it could equally be a gift from both aunties/uncles etc. The ‘ClimbIt” exhibit looks so much fun. But don’t ask if they’ll let adults play on it… the answer is no.